On a Sunday evening in October 1992, nineteen year old Lee Heyes welcomed nine students to his first club opened at a local church hall in Hambleton over-wyre. Over the years, this village club has accommodated many students and to date has successfully nurtured several Instructors and Black Belts. Kirkham appeared on the map in July 1999, Penwortham. 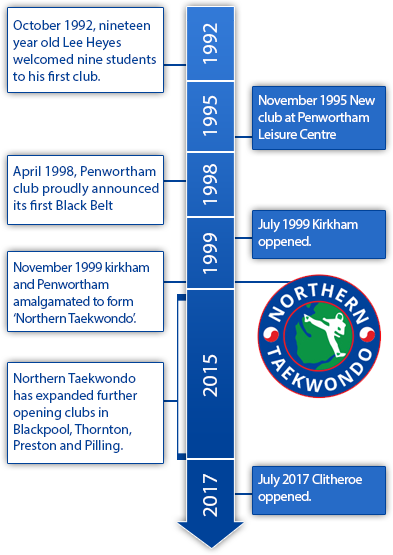 In November 1999 the clubs owned and instructed by Lee Heyes amalgamated to form ‘Northern Taekwondo’. Since then Northern Taekwondo has expanded further opening clubs in Blackpool, Thornton and proving that Lee’s (and his instructors) teaching methods continue to be as enjoyable and popular as ever. Northern Taekwondo also runs after school/ Breakfast clubs Taekwondo clubs in several schools in Blackpool. Northern Taekwondo now also specialises in breakfast club and after school classes. We teach in over 10 schools throughout the North West. In addition to first class tuition, regular Kup (coloured belt) Gradings and (Black Belt) Gradings, Northern Taekwondo is able to provide access to a wide range of fighting and traditional technique competitions. As well as Referees courses and Master Seminars and is able to obtain Kukkiwon certification for Black belt gradings. Northern Taekwondo is now a full independent member of the BTC which is recognised by Sports England as the National Governing Body for Taekwondo in Great Britain. People in primitive ages, no matter where they lived, had to develop personal skills to fight in order to obtain their food and to defend themselves against their enemies, including wild animals. The long experience of ancient people in defending themselves against the attacks of animals, as well as their imitation of an animals attack and defensive positions, slowly lead the people to develop more effective skills of their own in the use of limbs for fighting; here was created a primitive form of Taekwondo called “T’aekkyon”. The origin of Taekwondo in Korea can be traced back to the ‘Kogury’ dynasty which was founded in 37BC; mural paintings in ruins of royal tombs built by this dynasty show scenes of Taekwondo practice. Taekwondo was also practised during the ‘Shilla’ dynasty, which was founded in the South Eastern part of Korea, some twenty years before Kogury in the North; evidence can be found in stone sculptures. Archaeological findings of both the ‘Kogury’ and ‘Shilla’ kingdoms show evidence of fighting stances, skills and movements resembling the present form of Taekwondo. Therefore, it can be said that these people practised an art very like the one we study today. Later, during the ‘Kory’ dynasty, Taekwondo (then known as “Subak”) was practised not only as a skill to improve health and as a sport activity, but it was also encouraged as a Martial Art of considerably high value. “Subak” is believed to have gained its highest popularity during this era. During the ‘Yi’ dynasty (1392-1910AD) a book was published to teach “Subak” as a Martial Art, which made it more popular amongst the general public, whereas in the preceding ‘Kory’ dynasty it was monopolised to a certain degree by the military. Furthermore, people who aspired to be employed by the military department were eager to learn “Subak” as it was one of the major subjects in the applicants entrance test. The latter half of this dynasty saw the decline of “Subak” as a Martial Art, which merely remained as a recreational activity for ordinary people. In the first half of the 20th Century, Japanese imperialists colonised Korea by a forceful invasion. The oppression of the Korean people by the Japanese imperialists became worse, and the practising of Martial Arts, which could have been used as a means of revolt, was forbidden. However, Taekwondo persisted in the spirit of the Korean people as a legacy to pass on to the younger generation. After liberation from the Japanese rule on August 15th 1945, those with an aspiration to revitalise the traditional art of Taekwondo taught their followers, and at last, on September 16th 1961, the Korea Taekwondo Association was established. In 1962 the Korea Taekwondo Association joined the Korea Amateur Sports association and in 1963 Taekwondo became an official event for the first time in the National Athletic Meet. Korean instructors began going abroad to teach Taekwondo in the 1960s, which could be seen as the turning point in the history of Taekwondo. In 1973, Taekwondo made its name as a world sport through the 1st World Taekwondo Championships held in Seoul, Korea. This event was supported by the participation of 19 countries, who in the same year established the World Taekwondo Federation (WTF). Presently, member countries of the WTF total 145 and the global Taekwondo population is estimated at 40 million people. Taekwondo was first introduced into the Olympics as a demonstration sport at the 24th Seoul Olympics held in 1988 and is rapidly becoming an international sport, consolidating its position in the world as fast as any other Martial Art.